Annual town meeting saw smaller crowd on third and final night. 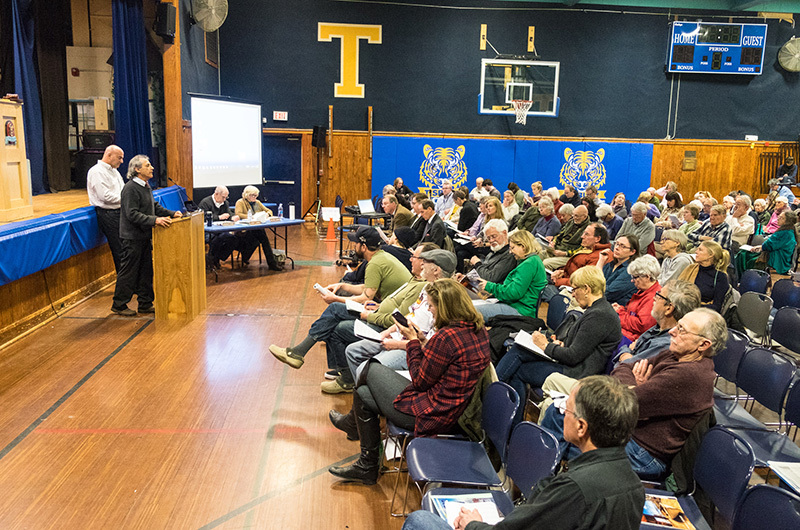 In the third and final night of the annual town meeting, Tisbury voters agreed to buy property for a new town hall and fund improvements to the harbor wall on Beach Road, and did away with the town meeting lottery system. Moderator Deborah Medders presided as voters worked through 30 remaining warrant articles on a 40-article warrant. The town meeting opened Tuesday; most of the first two nights were taken up by discussion and a vote on the $46.6 million new school project. On Thursday night 135 voters turned out, far fewer than on the first two nights, when more than 400 voters filled the school gymnaium each evening. The $625,000 purchase of property at 55 West William street intended for a new town hall passed easily. Town administrator Jay Grande and town clerk Hillary Conklin outlined the need to relocate from Association Hall, citing lack of space for staff and records. The second floor of the building is the Katharine Cornell theatre. Still, an amendment to the article struck language specifying the property had to be used for a town hall. Before the vote, longtime Island realtor Peter Cronig had a question. “How big is the lot?” he asked. “Just over an acre,” Mr. Grande replied. “That’s an excellent price. You should buy it,” Mr. Cronig said, drawing laughter and applause. Harold Chapdelaine, chairman of the town historic commission, reminded voters that the existing building on the property would need review and approval from his commission and the Martha’s Vineyard Commission before it could be demolished. The town also voted to spend $50,000 on planning for the new town hall and maintaining the property. Voters also approved $400,000 to repair or replace the steeple on the town hall. Town facilities manager Kirk Metell explained the project. “What we’re proposing is to take the steeple off, have it possibly rebuilt at a remote site, and put it back on,” he said. There was lengthy discussion over a request for $104,000 for design and engineering improvements to the seawall and harbor walk on Beach Road. Mr. Grande said the town has been working to improve public access in the area since 2014. He said the town would only spend the $104,000 if it is successful in obtaining a federal grant to cover the remaining planning costs, estimated at more than $400,000. Much discussion centered around frustration with the slow pace of the Beach Road improvement project. The state Department of Transportation is responsible for the road, but selectman Melinda Loberg said beyond that, “they say the wall is ours.” She said she’s hopeful the state will eventually provide grant money for the project as well. Selectman Tristan Israel echoed the frustration. “I do think we need to support this and go through this process, but . . . I just do want to bash the state for not taking responsibility for this wall when we were building the Lagoon Pond bridge,” he said. Clarence A. (Trip) Barnes 3rd moved to table the article without success. The article passed on a voice vote. A town tradition ended Thursday night with a vote to do away with the warrant article lottery system. Unlike other towns on the Island, the Tisbury town moderator draws warrant articles from a pitcher, so the order of town meeting is completely random. The system began years ago as a strategy for maintaining quorum throughout the meeting. Nelson Sigelman, who petitioned to put the article on the warrant, said the system is no longer necessary. But some said Tisbury’s meetings are longer because the people of Tisbury are more engaged, not because of the lottery. “I think we put in a lottery system for a very sound reason,” he said. The article passed 77 to 47 in a standing vote. 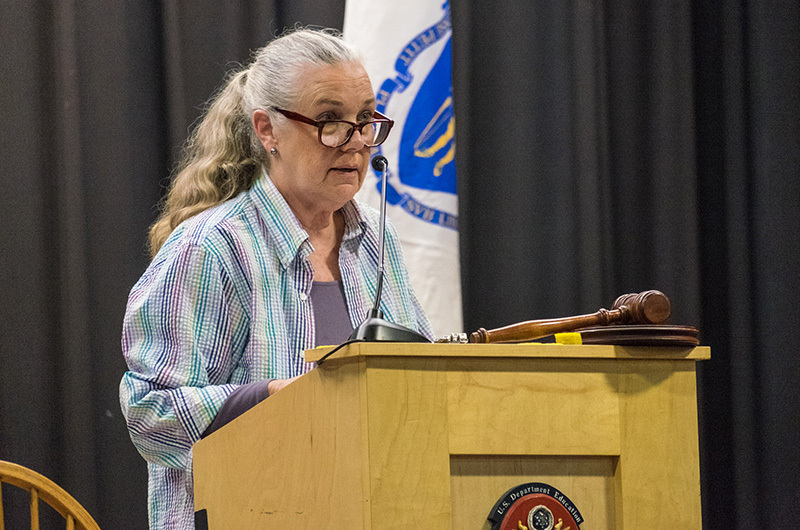 As the meeting drew to a close, Ms. Medders took a moment to reflect on the three nights, noting that this year’s annual town meeting was historic. “It is the people, it is you all, this is your meeting, and those of us who are responsible for providing you with this forum, I want all of us to be mindful that it is your meeting,” she said.